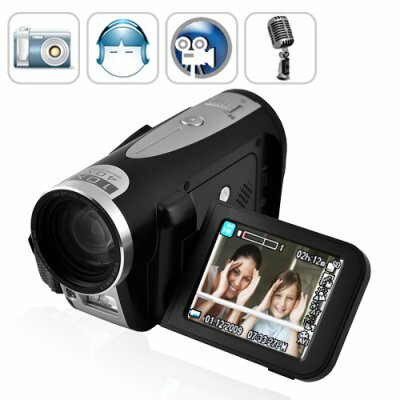 Successfully Added Luxim Camcorder Video Camera (10x Optical + 6MP CCD + Ext MIC) to your Shopping Cart. The Luxim Digital Camcorder with x10 optical zoom for distant video capture, a stunning 6MP CCD lens for brilliant optical clarity, and external microphone support for enhanced and convenient audio capture. The Luxim digital video camera is the one to get if you're looking for a versatile camcorder that's performance focused yet easy to use at an affordable price! Now with FREE 2GB SD card included! Optics: The Luxim is a great mid-range camcorder for intermediate users. It features a x10 optical zoom lens with a 6 megapixel CCD (Charge-coupled device) image sensor that promises better image results than conventional CMOS lens cameras every time. Picture quality is exceptional and you choose whether you want to save captured videos to 30 fps (frames per second) AVI, ASF, or MOV format files! Features: The Luxim is one of the few wholesale performance camcorders we carry which supports external microphones. Now you can create videos with better than average built-in MIC audio quality. Perfect for interviews or webcam websites! But The Luxim isn't just a great digital camcorder, it's also an outstanding 6MP digital camera and voice recorder in one! Easy To Use: The Luxim was designed to be simple to use. To that end, it comes with everything you need to shoot great videos right out of the box! Press the power button, press the record button and great Youtube videos are just a click away. The buttons are where you'd expect them to be and the menus are straightforward and intuitive - just as a great digital video camera should be. Brought to you by the Digital Camera and Camcorder China wholesale dropship experts - Chinavasion. Now with FREE 2GB SD card included! - External: SD Card (up to 2GB) Now with FREE 2GB SD card included! Now with FREE 2GB SD card included so everything you need to make great quality videos comes right out of the box! Is this camcorder compatible with my Mac (or Linux) computer?Yes, for USB file transfer it is compatible with most computer types. However the included software is only for Windows PC's.